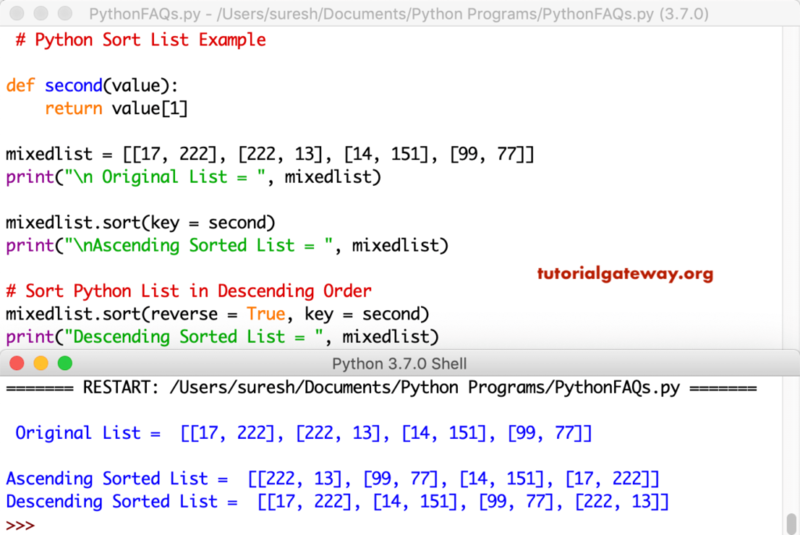 Python Sort List is one of the List method, which is used to sort a given list in ascending order. 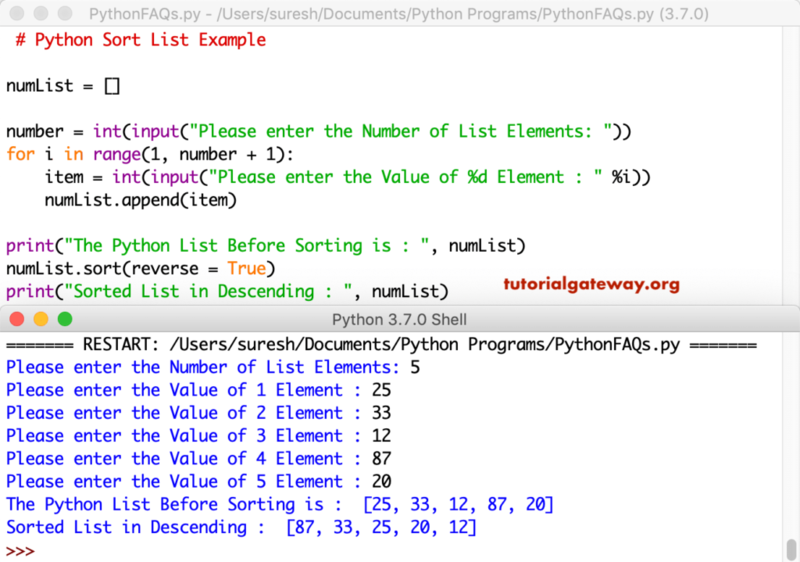 In this article, we will show you, How to use this Python List Sort function with practical examples. Here, Function_Name can be any user defined function. Or you can use, any built-in function like len, min, max etc. The following examples show you, how to sort integer list items in ascending, and Descending order. The sort function has an argument called reverse = True. This allows us to sort the list items in descending order. 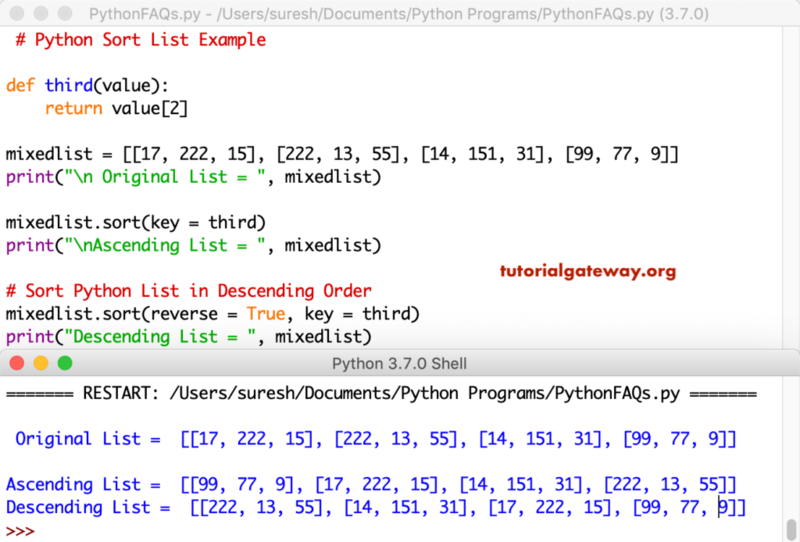 Below code will sort the integer list elements in Descending order or reverse order. 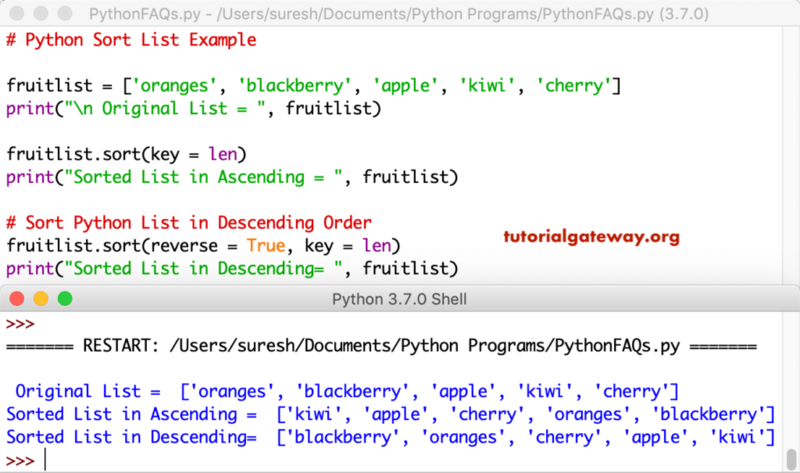 This section show you, how to sort string list items in ascending and Descending order. In this example, first, we declared a string list. 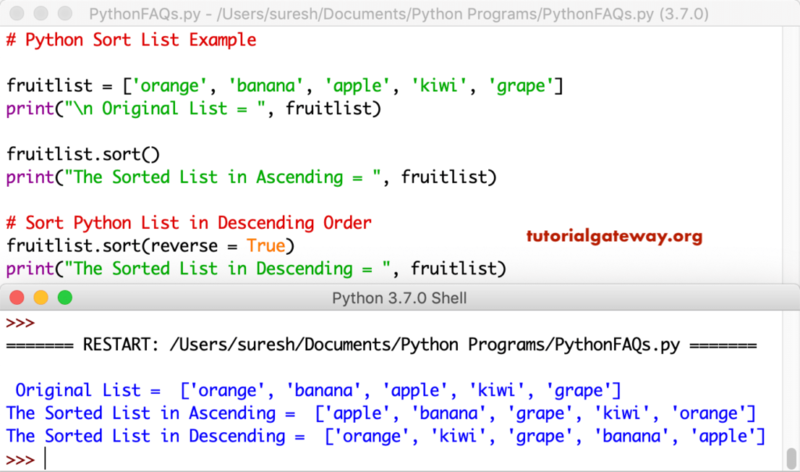 Next, we used python list sort function to sort them in ascending order. 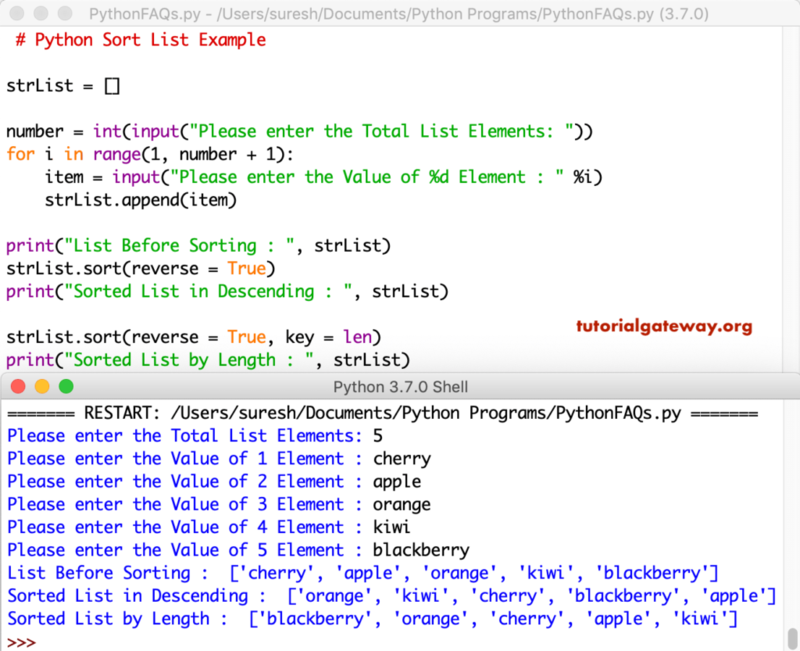 Here, sort function will use alphabetical order to sort string list. In this example, we used the reverse = True option inside the Python sort function. It means, this example returns the reverse order of the above example. Th sort function on list items has another argument called key. This accepts any function to determine the sorting factor. In this example, we created a user defined function called length. This will find the length of a given string. Next, we are using this function as the key value. It means, fruits list will be sorted based on the length in the ascending order. In the next line, we used the reverse argument, along with this key argument. This will sort the fruits list based on each word length in descending order. To use the key argument, you don’t have to create a custom function. 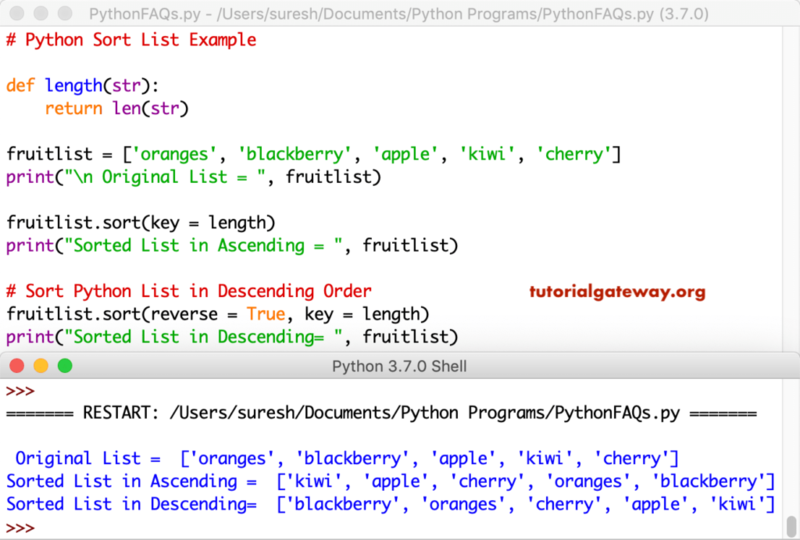 Python allows you to use any built-in functions. This example is same as above example. However, we are using the built-in common len function. It means, first one will sort the list based on word length in ascending. Second one will sort in Descending order using their length. Let me use this sort function on Mixed List. The following examples help you understand the sort function on nested list items. 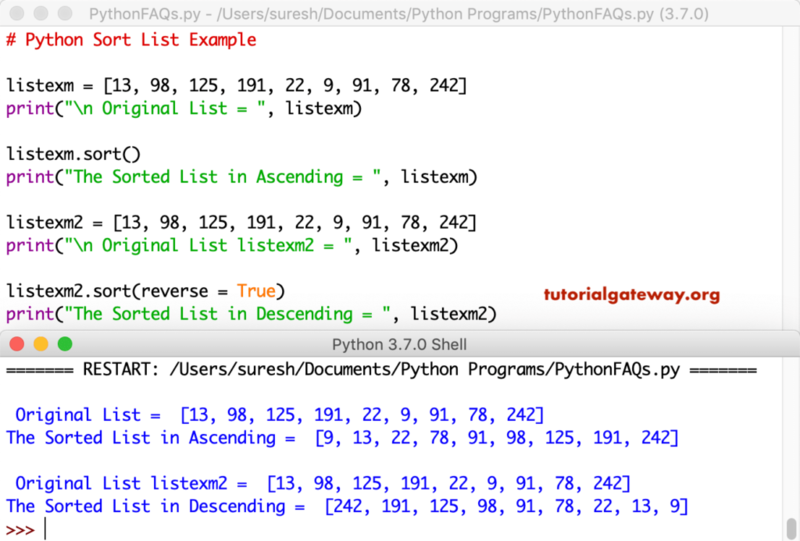 This time we used python sort function on Nested list (list inside list). Here, Sort function uses first value in each nested list to sort them in ascending order. You don’t have to restrict yourself by sorting the nested list with first value. By creating a user defined function, you can use any value to sort the nested lists. In this example, we created a function to select the second value as the key to sort the list. It means, the first code snippet sort the list items based on the second value in a nested list. Second line sort in descending order using second item. We have taken another example to explain this key argument, and the custom functions. This time also we used second value a the sorting key. As you can see, though, we have three values in a nested list, it was sorting the list items by second item. Let me change this key value to 3 nested list value. This can be done by changing the item index position to 2 in a user defined function. As you can see from the below screenshot, it is sorting the list by using the third nested list item. This python program is same as first example. However, this time we are allowing user to enter the length of a List. Next, we used For Loop to add numbers to the list. 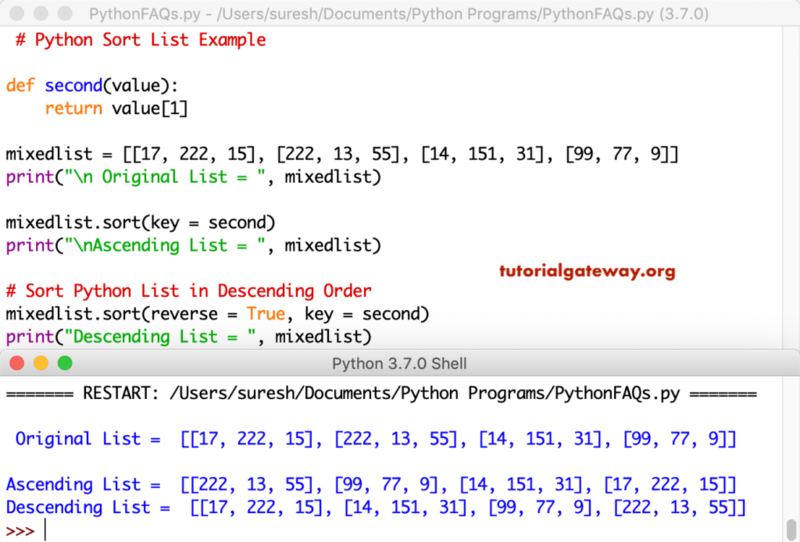 Lastly, we used python list sort function to sort the integer list in ascending order. This is same as above example. However, this time we are using the reverse argument to sort the list the Descending order. This program is similar to above example. However, we used the reverse argument inside a function to sort the string item sin descending order. Next, we used the key = len to sort the list item sin ascending and Descending order using the string length.